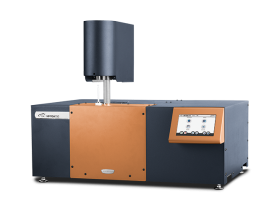 TA Instruments invites you to experience two new high pressure thermogravimetric (HP-TGA) instruments, the Discovery HP-TGA 75 and HP-TGA 750. From the world leader in Magnetic Suspension Balance (MSB) technology for over 20 years comes an ingeniously designed, user-friendly top-loading microbalance with unprecedented performance. 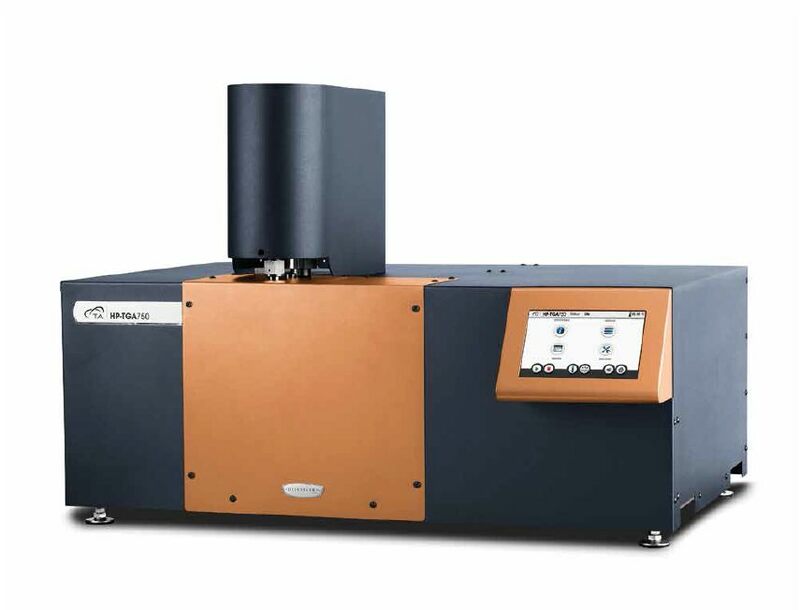 In addition, the Discovery HP-TGA’s are the first available in a convenient benchtop design and feature on-board gas dosing and blending systems, temperature control to 1100°C, One-Touch-Away™ functionality, and TA’s powerful TRIOS software. Getting great high pressure data has never been so easy! 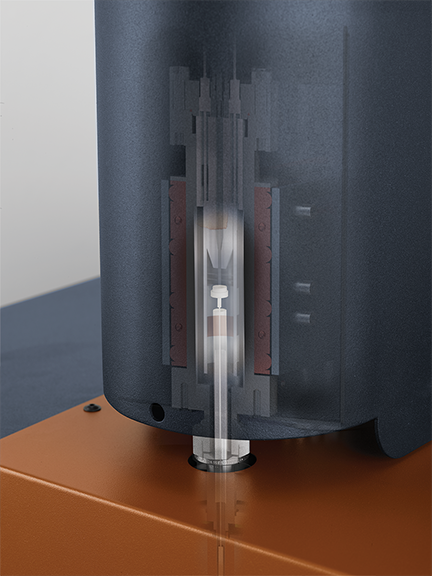 At the core of every Discovery HP-TGA is the new top-loading magnetically-levitated (MagLev) balance. Multiple patented technologies are combined to bring to life a highly sensitive and compact balance that can operate under high pressure and high temperature. Within the Mag-Lev Balance, a small-diameter high pressure-resistant steel alloy tube encloses a suspension shaft and crucible setup. A dual Anti-Helmholtz coil array, LVDT electronic sensor coils and the quadrupole magnet assembly are outside of the tube. The Anti-Helmholtz coils generate an extremely uniform electromagnetic field which levitates a permanent magnet attached to the suspension shaft. A platform at the top of the shaft holds the sample crucible. The suspension shaft is centered horizontally inside the tube by patented 2D magnet quadrupole bearing rings located at the top and bottom of the shaft. 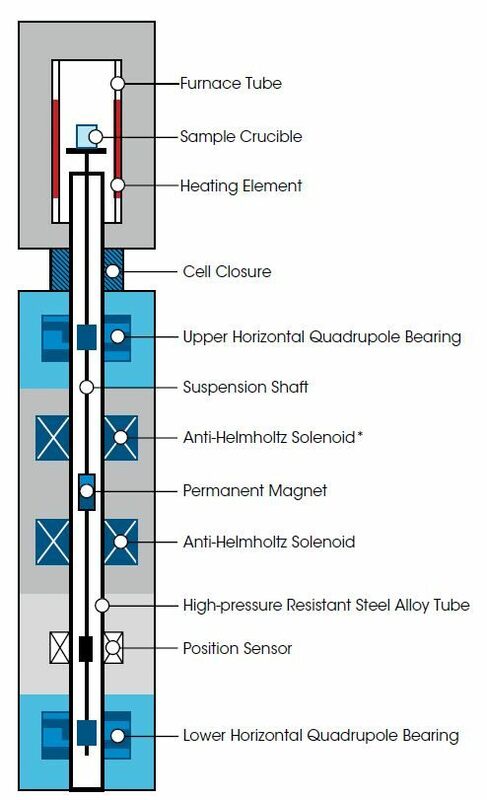 The vertical location of the permanent magnet is held constant via a control feedback loop between the Anti-Helmholtz coils and an LVDT position sensor with sub-micron resolution located on the shaft below the magnet. The amount of current that is delivered to the coils in order to maintain a constant position of the magnet is proportional to the weight of the shaft, magnet, and crucible. This weight is set to zero through a balance tare. When a sample is added to the crucible, the current required to maintain the balance position is now proportional to the sample weight. In this configuration, the components contained within the small-volume tube are completely sealed off from the outside. The electronmagnetic coils and other sensitive parts are located outside of the tube and operate under normal atmospheric conditions to generate the electromagnetic levitation force through the pressure-resistant tube. Only the sample crucible and other components within the small-volume tube need to be pressurized and can be exposed to a variety of gases or gas mixtures. This complete separation of the balance electronics from the reaction atmosphere enables TGA measurements to be performed from vacuum to high pressures using toxic, corrosive and explosive reaction atmospheres. 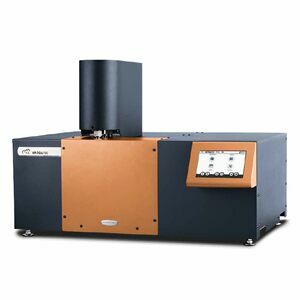 An innovative high-pressure reaction furnace for the most accurate and responsive temperature control under ALL pressure and gas flow conditions. At the core of the Discovery HP-TGA furnace is a robust corrosion resistant ceramic tube with an embedded platinum heating element capable of temperature control to 1100°C*. Sample temperature is measured by a thermocouple within the heater tube directly adjacent to the sample. The compact, low-mass design is highly responsive and capable of heating/cooling rates of up to 250°C/min. The ceramic heater tube is contained within a pressure vessel which enables characterizing samples to 80 bar. Testing can be performed in corrosive reaction atmospheres and, as no porous material is in contact with the atmosphere, changing of the reaction gas is clean, fast, and without any memory effects. The Discovery HP-TGA is the only high pressure TGA to feature Curie-point temperature calibration at any pressure and with any reaction gas. 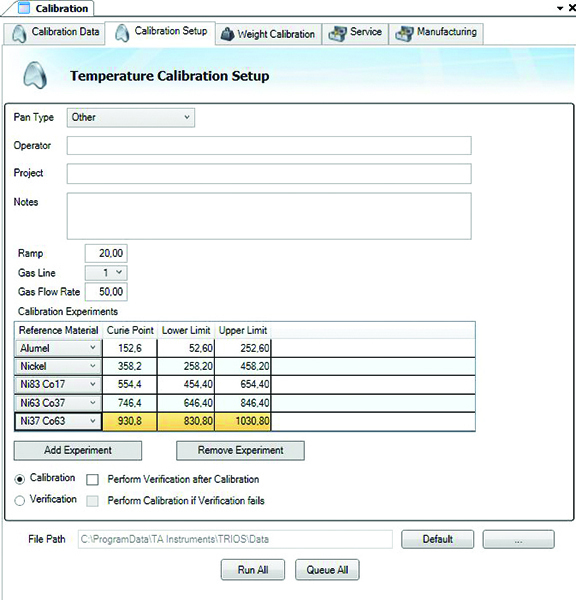 HP-TGA temperature calibration has never been so easy. The accuracy of TGA measurements depends on reliable control of the pressure and composition of the reaction atmosphere. All Discovery HP-TGA models feature integrated gas dosing and blending systems with pressure controllers, which ensure the highest data quality while providing flexibility to address the widest range of applications. The pressure can be controlled in the range from 200 mbar to 80 bar or complete evacuation to ultimate vacuum. 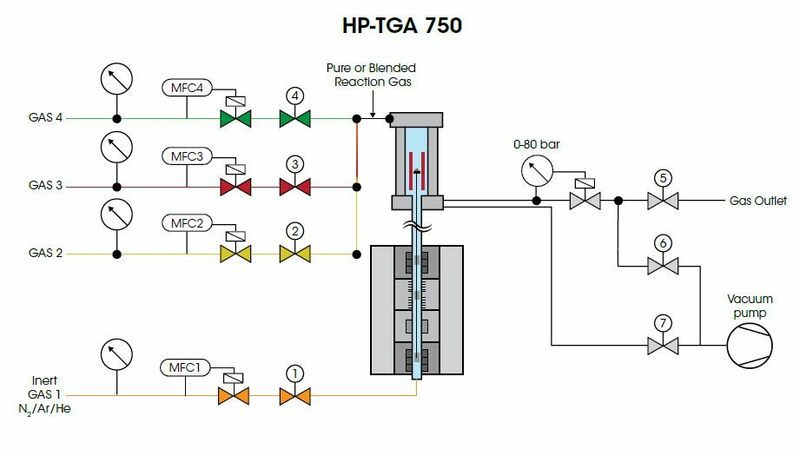 Both the HP-TGA 75 and 750 instruments include a mass flow controller connected to an inert gas for the balance purge. 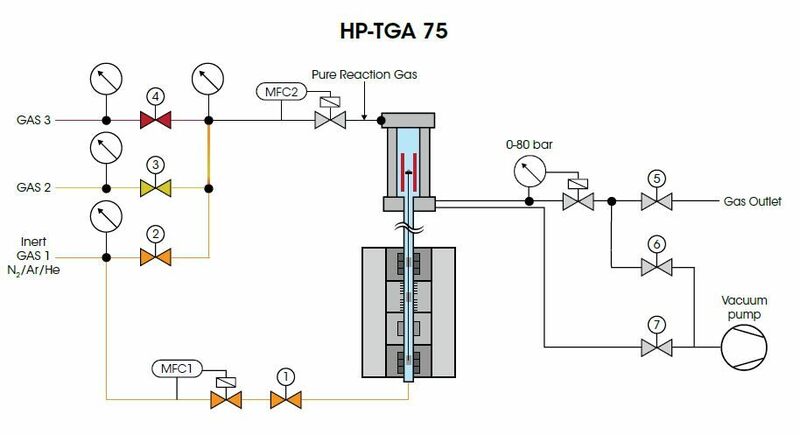 The Discovery HP-TGA 75 is equipped with a single reaction gas mass flow controller and three gas connections. One reaction gas can be selected from the three connected. During a measurement the reaction gas can be switched. The Discovery HP-TGA 750 is equipped with three reaction gas connections and three independent reaction gas mass flow controllers, which enables the reaction gas to be a pure gas or a blend of up to three gases. The HP-TGA 75 and 750 boast a brand-new One-Touch-Away™ app-style touch screen that greatly enhances usability by placing key instrument features at your fingertips. Packed with functionality to simplify operation and enhance user experience. WITH ONE-TOUCH-AWAY, IT’S NEVER BEEN EASIER TO GET GREAT HIGH PRESSURE DATA! The Most VERSATILE CONTROL and ANALYSIS SOFTWARE! 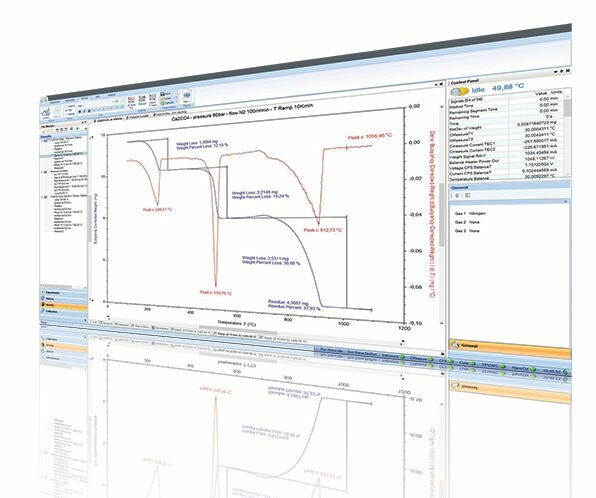 Discover powerful TRIOS software that delivers exceptional user experience in a combined package for instrument control, data analysis and reporting for thermal analysis and rheology. New features such as multiple calibration sets, real-time test method editing, and inter-laboratory data and test method sharing provide unmatched flexibility, while one-click analysis and custom reporting raise productivity to new levels. TRIOS software makes calibration and operation of the entire line of Thermogravimetric Analyzers simple. Users can easily generate Curie-point temperature calibration data sets under varying experimental conditions (e.g. different pressures or gas selections) which are automatically applied to match the experimental conditions used for sample testing. 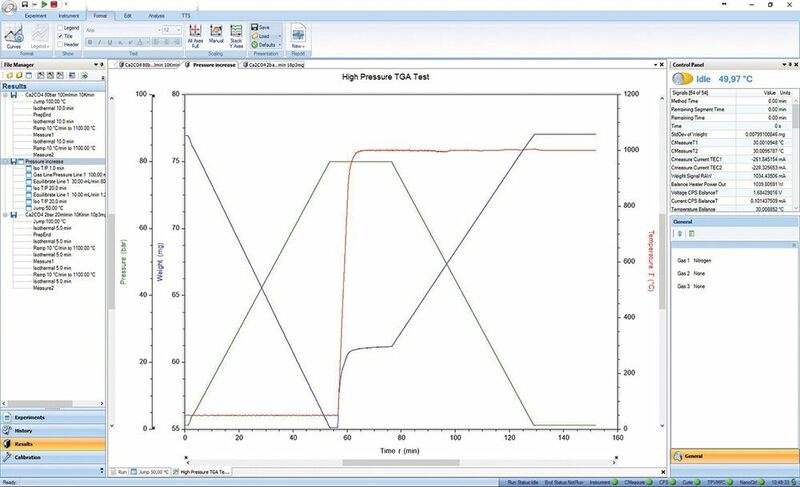 Real-time signals and the progress of running experiments is readily available with the added capability of modifying a running method on the fly. 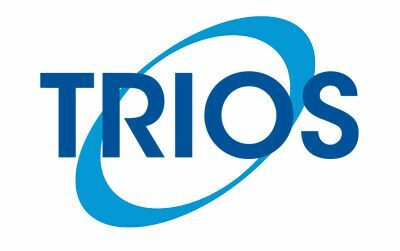 TRIOS software offers a level of flexibility that is unmatched in the industry. The advanced data collection system automatically saves all relevant signals, active calibrations, and system settings. This comprehensive set of information is invaluable for method development, procedure deployment, and data validation. A comprehensive set of relevant tools are available for real-time data analysis, even during experiments. Gain actionable insights into material behavior through a powerful and versatile set of features seamlessly integrated into TRIOS. Calcium Oxalate is a widely characterized material with very well-known and understood weight loss behavior. It undergoes three discrete decomposition events, each with a pronounced step change in weight. The onset of the weight change associated with each decomposition is affected by sample mass, heating rate, and pressure. The magnitude of the weight changes, as a percent of total starting weight, should not change with these variables. In standard thermogravimetry measurements (TGA), the onset of decomposition can be studied under variable mass and heating rate. However, with the TA Instruments high pressure TGA (HP-TGA), measurements can be conducted as a function of all three variables (mass, heating rate, and pressure). 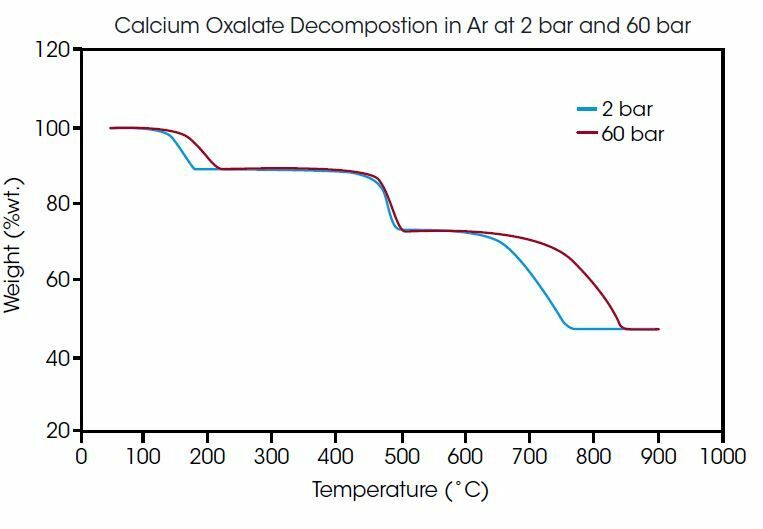 In the diagram above, two Calcium Oxalate decomposition measurements in Ar at 2 bar and 60 bar pressure are compared. While the decomposition temperatures of the three steps are all shifted to higher temperatures at high pressures, the weight changes in each decomposition step are identical. This illustrates the kinetic nature of decomposition. Varying the pressure, heating rate, or initial sample mass will impact the temperature at which a material decomposes. Coal, biomass, waste and other organic materials are gasified for energy utilization or as alternative feedstock. Such processes can be measured under application-relevant conditions in the Discovery HP-TGA. The first step in a gasification process is pyrolysis of the raw material, where, while heating the organic material in an inert atmosphere (eg. N2 or Ar), volatile components (water, hydrocarbons, tar) are evaporated and char is generated. Gasifying this carbon-rich char as a second reaction step requires a gasifying agent. Additional gases can be products of further or incomplete conversions and side reactions. Because the process reaction kinetics depend on the reaction conditions and the raw material, the composition and pressure of the gases generated will vary. Discovery HP-TGA instruments allow optimization of operating conditions for a given raw material. In addition, they can be equipped with a mass spectrometer for evolved gas analysis. In the diagram below, the pyrolysis and gasification process of a lignite at 30 bar measured with the Discovery HP-TGA is shown. During heating to 1000°C at a heating rate of 10°C/min, Ar is dosed as the reaction gas. The resulting weight loss of approximately 60% is due to charring and pyrolysis of the lignite. 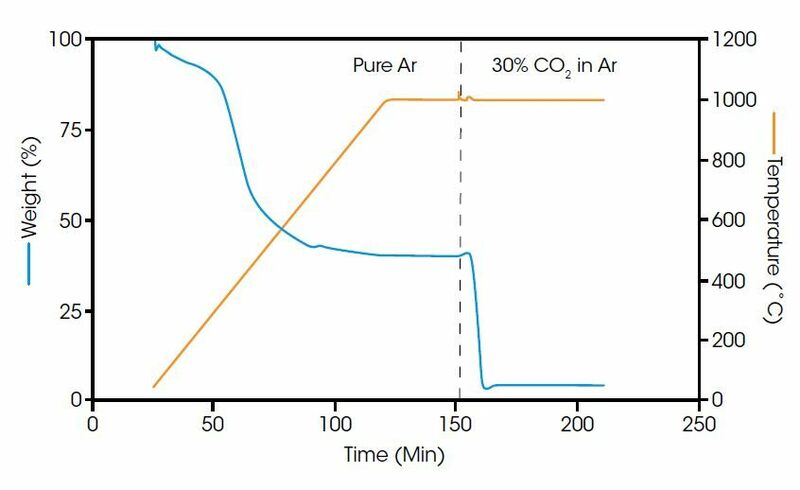 When constant weight is reached, 30% CO2 is blended into the Ar to start the gasification process. Gasification leads to another weight loss of 35%. Burning of solid or liquid fuels is an oxidation process. The oxidation temperature and the reaction kinetics depends on the pressure and the oxygen content of the reaction gas. With the Discovery HP-TGA the influence of pressure and oxygen concentration on the oxidation can be studied. 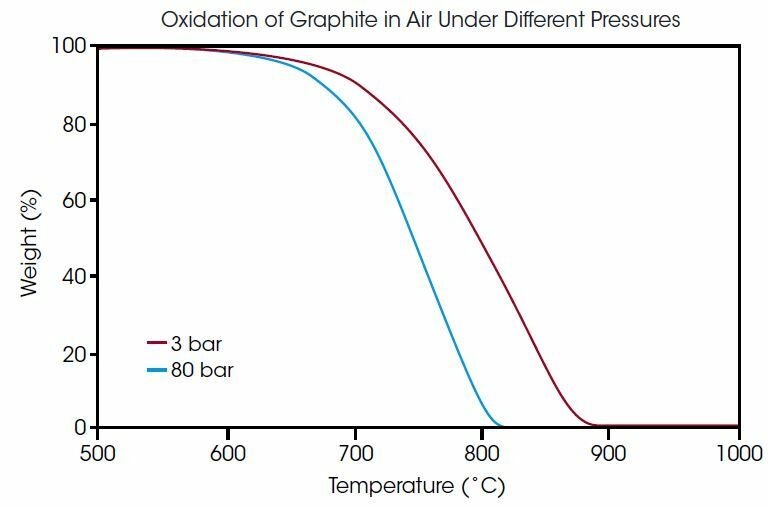 In this example, graphite was oxidized in air at 3 bar and at 80 bar. The data in the diagram above show that at the higher pressure of 80 bar, the reaction comes to completion at a much lower temperature compared to the experiment at lower pressure. The ability to complete a reaction with lower energy input can save significant cost in manufacturing processes. Some relevant applications include pressurized fluidized bed power plant design and underground coal gasification. Understanding the corrosion resistance of a material can be critical for improving technical processes and increasing efficiency. For example, the efficiency of gas or steam turbines and jet engines is directly related to their maximum operation temperature. The maximum temperature is limited by the high-temperature corrosion of the materials used. The mass change of a metal or other material caused by corrosion is generally very small. Additionally, even high temperature corrosion is usually a slow process. The Discovery HP-TGA is ideally suited for such measurements because the exceptional high resolution and accuracy allows measurement of small changes in sample mass over a comparably short period of time. 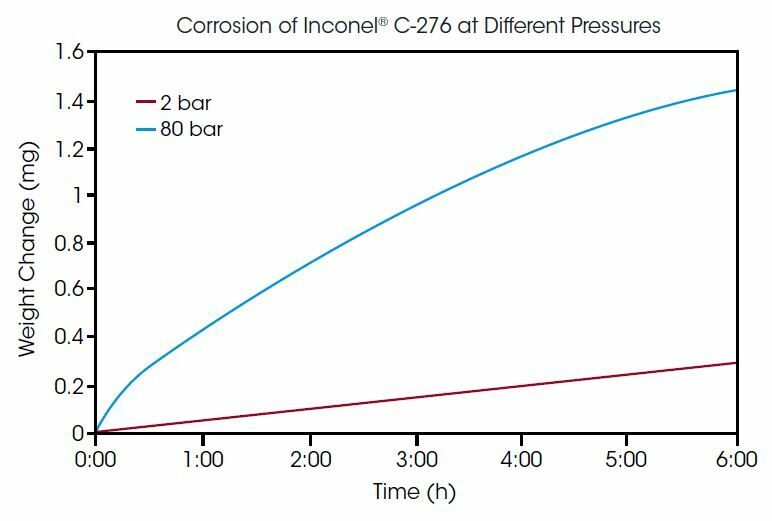 The figure above compares the mass increase of a Inconel®* C-276 alloy in air at 1000°C at 3 bar and at 80 bar. The observed weight gain is caused by oxidation of the alloy’s surface. The total mass change here is about 287 μg at 3 bar and 1444 μg at 80 bar. As expected, the pressure of the corrosive atmosphere has an influence on the kinetics of, and amount of corrosion. 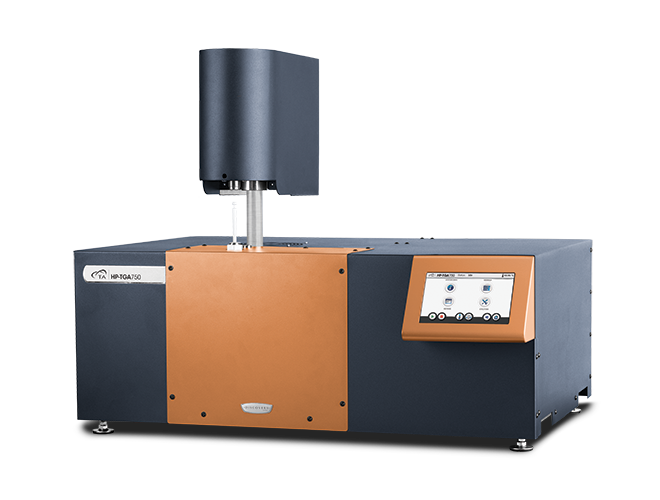 Thermal decomposition of polymeric materials is a routine thermogravimetric test. The new Discovery HP-TGA enables the added dimension of understanding the influence of pressure on decomposition temperatures and kinetics. This information is critical to define the limits of operation which should not be exceeded during manufacturing or applications. Polymer materials can be tested under real-world conditions using the actual pressures and reaction gases of interest. 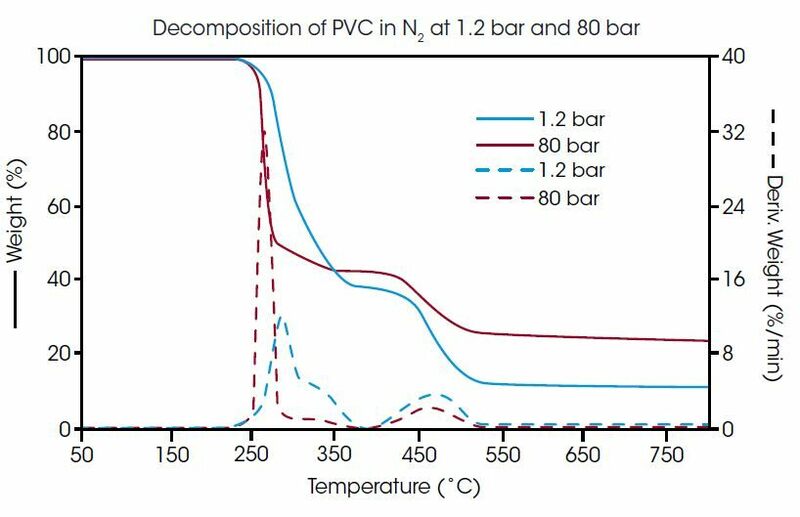 In the diagram below, the decomposition of PVC-P in nitrogen gas is compared at pressures of 1.2 and 80 bar. The decomposition is a multistage process. Typically HCL, aliphatic and aromatic hydrocarbons are the decomposition products. At higher pressure, the kinetics of the first step of decomposition is much faster compared to the measurement at ambient pressure. The following decomposition steps are more clearly separated than at low pressure. Decomposition temperature is not significantly changed by the higher pressure. At 80 bar however, a residue of ca. 23%wt is remaining after the decomposition while at ambient pressure only 10% of the PVC is not decomposed.